● Magnet’s overall network quality indexed at 39% faster than competitor UPC. For the 6th consecutive month, Magnet.ie, has topped the Netflix ISP Speed Index, as the fastest internet service provider in Ireland. The index compares the speeds of all major Internet Service Providers (ISP) in Ireland. The index, released monthly, sees Magnet.ie increase its speeds further, to 2.40 Mbps and widen the gap between its rival, UPC, by 39%. Magnet.ie has maintained speeds above 2.0 Mbps since January, improving with every month in contrast with other providers in Ireland, who have been unable to break the barrier of 1.9 Mbps in the same time frame. Photo (L to R): Munster Rugby Players, CJ Stander, Paddy Butler and Dave Kilcoyne. Netflix is among the world’s most popular Internet application. As such, the Netflix index provides valuable evidence for consumer looking for a provider with the best and most reliable network. The Netflix ISP Speed Index website aggregates performance results from its worldwide members, and allows consumers to see which ISPs offer the best Netflix performance. The listed speeds reflect the average performance of all Netflix streams on each Internet service provider’s network and are an indicator of the performance typically experienced across all users on a network. In addition to Ireland, results for broadband providers in the USA, UK, Denmark, Sweden, Finland Norway and Mexico are also published. 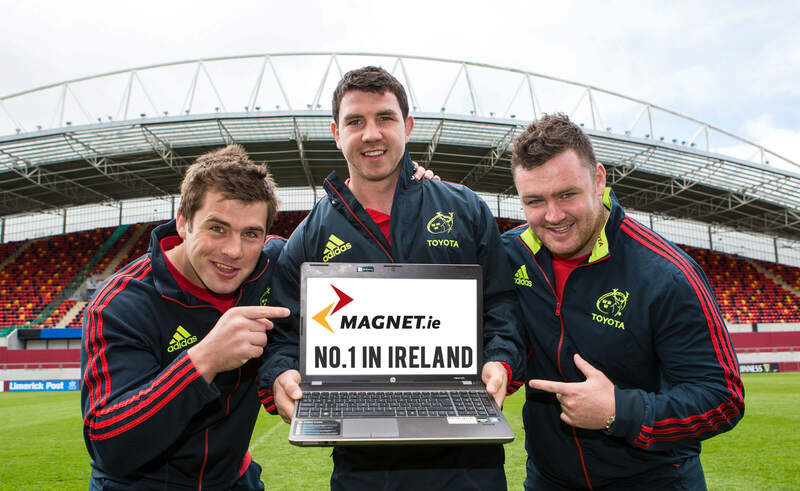 Magnet.ie, who are sponsors and broadband provider to Munster Rugby, offer fibre internet packages free from contract with unlimited downloads making downloading and streaming from sites such as Netflix hassle free. Irish residential & business are encouraged to see if the Fatpipe Fibre services are available in their location by checking their address on Magnet.ie. Note: The speeds listed in the Netflix ISP Speed Index reflect the average performance of all Netflix streams on an ISP’s network and are an indicator of the performance typically experienced across all users on an ISP network. The average performance is below the peak performance due to many factors including the variety of encodes Netflix uses to deliver the TV shows and movies as well as the variety of devices members use and home network conditions. These factors cancel out when comparing across ISPs. Magnet is actively challenging both the residential and business markets through Magnet.ie and Magnet Business and has provided voice, internet and television services to the Irish marketplace since 2005. 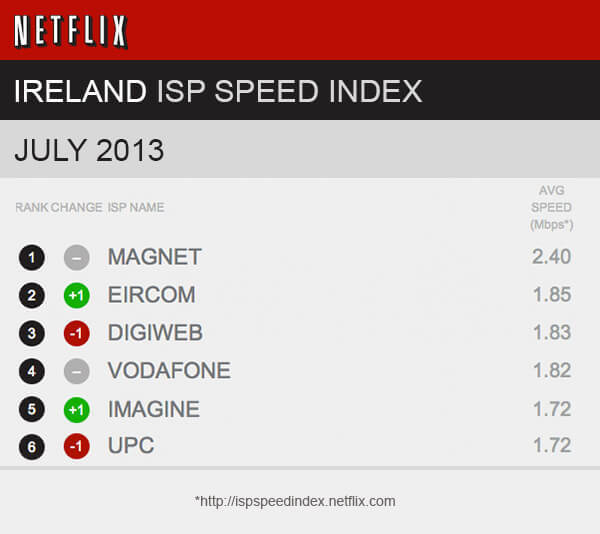 Magnet is currently rated as the fastest internet service provider in Ireland by NETFLIX since Feb’ 2013.